A truly superior glove for use in cold, harsh conditions, the Flexitog Alaska Women's Thermal White Gloves FG11AW use a Thinsulate lining to provide exceptional, long-lasting warmth. Their grippy and flexible design provides wide-ranging versatility, proving useful in applications that range from general outdoor use such as walking and gardening, to low-risk applications such as local authority use and utilities. The Flexitog Alaska Women's White Gloves FG11AW are perfect for extended use during applications that demand comfort, protection and warmth. 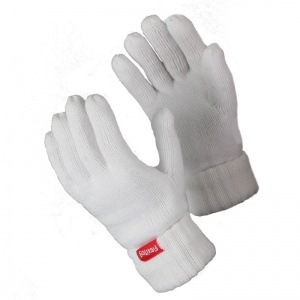 A Thinsulate lining ensures long-lasting comfort and keeps the user warm, while the flexible nature of the gloves promises to enhance handling productivity. The Flexitog Thermal White Gloves FG11AW are available in one size that should suit most users due to the flexible nature of the design.